Since I’ve tackled all the other majors already (EUR/USD, GBP/USD, USD/CHF), I decided to make my last trade idea for the week on USD/JPY. What’s my take on it? I’m going long! On the economic front, we saw that the GDP report for Q1 2011 came in at -0.9%. According to Pip Diddy, it was the second consecutive quarter that the economy printed negative growth. This means Japan has plunged back into recession! Yikes! USD/JPY’s reaction to the report seemed muted. After all, almost everyone expected the economy to bear the scars of the tsunami and earthquake that hit the country in March. However, I think that just like any girl, the market can only take so much. I’m expecting that the BOJ’s statement tomorrow would convince traders to dump the yen. Well, BOJ Governor Shirakawa has already expressed his pessimism on the economy, describing it being in a “severe” state. Uh-oh… With that, I’m bracing myself for the bank to announce further stimulus to spur economic activity. 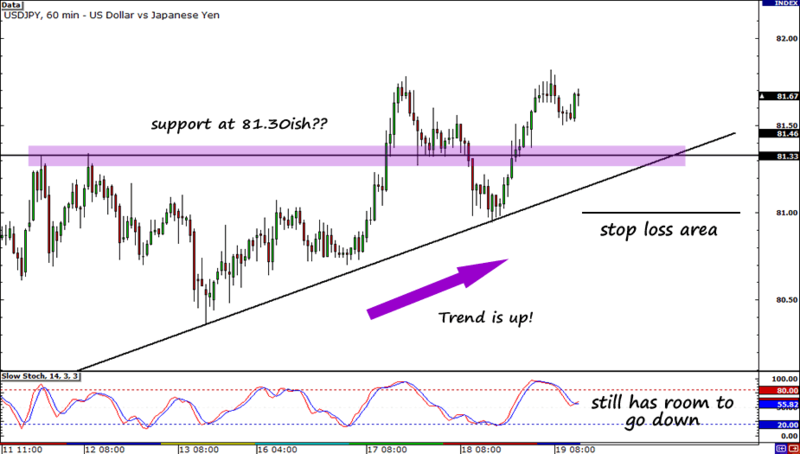 On the technical side of things, USD/JPY seems to be trending upwards. It has consistently been making “higher lows” and has been supported by a rising trend line. I believe the pair has more room to go up, but since I’m a girl who doesn’t like to settle, I’m going to wait for my desired price! I’m hoping to jump in the overall trend once price tests the intersection of the rising trend line and the horizontal support area around 81.30. Of course, I’ll wait for bullish reversal candlestick patterns to confirm going long (thank you candlestick cheat sheet)! To give my trade enough room to breathe, I’ll place my stop below 81.00, which is a major psychological level. I don’t know my profit target yet though, as price could make new highs if the trend holds. I don’t want to miss out! There ya have it! My fourth trade idea for the week! What setups are you looking at? Share your ideas in the comment box below! You can also write them on my Facebook wall or tweet them to me!